Welcome to our monthly blog post discussing the cash recovered in each stage of the collection process. We have tried to assign all recovery payments to a specific stage that was set closest to the payment date. While this approach is not always correct in the case where recovery stages are not promptly updated, it gives a very good overview of the drivers behind recoveries. When looking at the table above, it shows how effective each stage of the process is at recovering cash owed to investors and can help you understand why some stages are more effective than others. If you haven’t already read our previous posts on the ‘3-step collection and recovery process’ and ‘A snapshot of the recovery process stages, where do the numbers currently stand?’, then we would recommend that you check them out first. Whilst the total amount of recoveries across the board are lower than in October, the distribution over different stages of the process are relatively similar. In Finland, even though the total amount recovered was over 15% less than the previous month, the total amount of recoveries at the bailiff stage has increased by approximately 15% at €48,899. Why is the bailiff stage crucial in the recovery process? Take a look at the bailiff stage in the table above, it’s visible that once the bailiff has the ability to freeze the borrower’s income and assets this makes a significant impact on the amount of cash recovered. Ultimately, we aim to proceed to this stage as quickly as possible in order to begin generating a cash flow for investors. 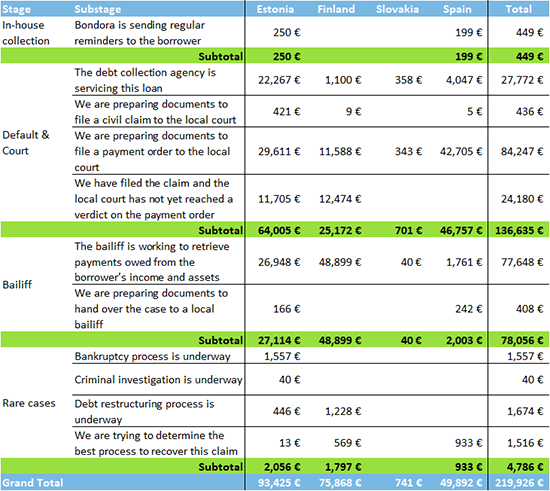 Once all cases can automatically be filed to the courts, we expect the cash recovered in the bailiff stage, as well as in the fourth sub stage of the Default & Court stage, to show the largest amounts across all countries. This is important because it means that we can start to generate a cash flow in a more time-efficient manner for investors.